As if you don't have enough to worry about! Dark Roasted Blend has posted a list of some of the world's most dangerous (and easy to miss) creatures. These are the ones that you step on when you aren't paying attention--or end up under your bed sheets if you've made an enemy in the mob. 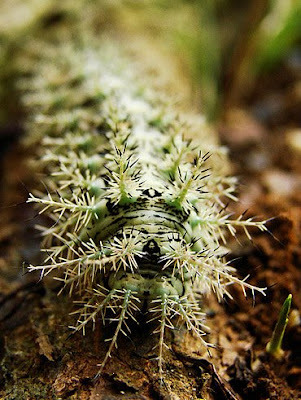 Take, for example, the venomous caterpillars of the lonomia genus (shown below). Native to South America, their exotic colors dazzle the eye and beckon young children to play with them. But the moment a human's skin brushes against the barbed hairs that cover the little beasts, a powerful poison is delivered into the bloodstream. It's said to kill dozens of people each year. Check out the rest of the Dark Roasted Blend list here. I was surprised to see that only one animal from Australia made the list. Aussies must contend with a wide range of deadly creatures, including the horrifying funnel-web spider and the lovely blue-ringed octopus. Heck, even the duck-billed platypus is poisonous, and you wouldn't want to mess around with any kangaroos, either! How DO you do it, guys? That's kind of sad. All those cute little creatures that can kill you. Yeah- my cousin and her boyfreind were leaving their native home of Ireland to go to Australia together. (They ended up staying for a year after everything, passports, liscences and all, were stolen.) Anyway, we bought them an Aussie's Guide to Surviving the Outback. It actually came in handy when the boyfriend got bitten by a snake! I love the picture of the box jellyfish. They're such beautiful, graceful creatures. Ananka: You should be happy to know that I chose underground cities for my End-of-the-Year report (I just hope they'll let me) !!!!!! Nellie: You're so sensitive! Great idea, Hazel. Jin Ai? What do you think? Anonymous: Cool! Let me know if you get the OK, and I'll fill your head with AMAZING information. I do have a funny Australian animal story, though. I was camping in a rural area with my dad when I was about 8. We were cooking a humble dinner of what ended up as burnt sausages, when a wallaby hopped up to us. I immediately dropped the hot dog, fearing for my life (I was, and still am, a bit of a wimp) and hid under a bench. And when I returned, my meal and the creature were gone. wow. that is really amazing such small animals can kill. Even if its a small amount of poison. Kind of puts things in perspective...haha. Yeah Im freaked out now. Yikes! Woulsn't want to go near them! Yes, Iris desereves a t-shirt. So does Jin-Ai. 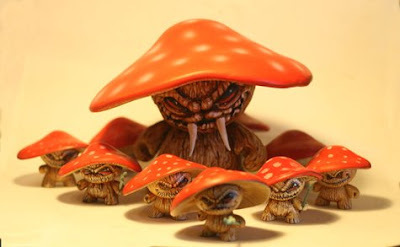 I LOVE the pic of the evil mushrooms! this is still on the subject of Horton Hears a who, but yesterday I was at the state GeoBee, and the final round was all boys! Also, my girl's soccer team shirt has a grown man playing soccer on it! "Patricia" is me, by the way. Oops. I live in Australia and we don't just randomly get attacked by dangerous animals walking down the street. The answer for funnel webs is to stay away from places they like to live e.g don't just randomly lift rocks up but the point is funnel web spiders don't just hang out in the open. Secondly platypus's are so cute and they live in streams and rivers anyway so they are not widely seen in the wild as most Australians live within an hour of the coast therefore they are more likely to go swimming in the beach and also thirdly and most importantly and this applies to kangaroos as well (kangaroos are NOT dangerous) the animals usually run away when you approach or are scared off it is only in zoo's that you are able tp approach the animals without them running away and even then they do not attack you.